Recycling household waste is a big help to the environment, as it saves natural resources and reduces the amount of rubbish sent to landfill sites. That's only half the job, however, and it's just as important to actively support recycling by making a conscious effort to buy products made from recycled materials. Buying recycled items helps to increase demand for the reclaimed materials collected by recycling schemes and encourages shops to stock more recycled products. It can also reduce the amount of materials going to landfill sites, conserve energy and resources and create jobs. Recycled products fall into three categories. The best for the environment are those made from 100 per cent recovered household or commercial waste. Some recycled products are made partly from materials recovered from waste and others are made from waste recovered during processing. There are plenty of myths surrounding recycled products, namely that they are expensive, hard to find, unattractive to look at, poor quality and consume more energy and resources than a product made from primary materials. The truth is very different. 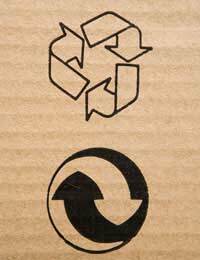 Recycled products should not cost more and are often competitively priced. They are increasingly found in high street stores and on supermarket shelves, and in terms of the way they look, it is impossible to distinguish between many recycled and non-recycled items. Materials like aluminium, steel and glass can all be recycled repeatedly without a loss in quality. Paper does suffer quality reduction and so can be recycled a limited number of times, but, high quality recycled paper is still readily available. Many recycled products offer significant savings in terms of energy and water as well as raw materials. For example, by saving trees, electricity and water, every tonne of recycled paper results in 74 per cent less air pollution and 34 per cent less water pollution than manufacturing the same amount of paper from virgin wood pulp. There are a few simple steps all consumers can take to ensure their purchases have less impact on the environment. Avoid products with excess packaging and try to choose items packaged in recycled materials. Recycle rags instead of buying new cloths or paper products. Buy long-life, energy-efficient and rechargeable products. Choose refillable or remanufactured computer printer cartridges and return spent cartridges for recycling. Use washable cups, plates and cutlery instead of paper or plastic disposable ones. Pick recycled tissues, toilet paper, kitchen rolls, writing paper, envelopes and refuse sacks. Ask store managers to introduce new ranges of recycled products. Persuade family and friends to buy recycled products. Find out if decision makers in the workplace have considered using recycled products. The range of recycled products on the market is growing all the time and they perform just as well as items made from raw materials. Before buying a product it's worth finding out of there is an equivalent one made from recycled materials. The wide variety of recycled products already available includes chairs, plant pots, dustbins, clothes, glass ornaments, toys, garden hoses, wellington boots, coasters, mouse mats, bollards, padded mail bags, pens, video cassettes gift cards and park benches.